Boy did I ever. It was roll-your-eyes-back-in-your-head good. There was a creamy layer of smoky fat on top, then perfectly cooked, perfectly pink meat. Sliced thin, the fat melted on your tongue. It was insanely good, and I wanted more. But Schiltz holds his recipe for smoked goose close, so I was going to have to reverse engineer the recipe. A tall order. I was at a loss until I read a throwaway line in an old book on German food, The Cooking of Germany by Time-Life Books. It is a very difficult to find book these days, but it is worth every penny if you are really into German cuisine. In its pages is a reference to something called spickgans, a style of smoked goose breast from Pomerania, on Germany’s Baltic coast. Spickgans is, apparently, a point of pride in this region’s cookery. 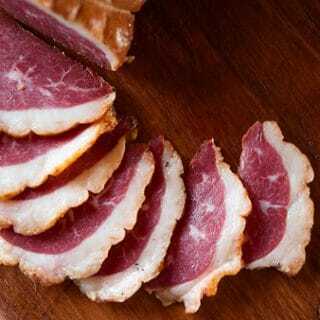 It is a domestic goose breast, cured and smoked over a combination of juniper boughs, beech, alder or oak, and peat moss. Like a lot of regional specialties, each household’s version is slightly different. Interestingly, this style of smoked goose has always been a cut above regular smoked goose. A menu from New York City’s Metropole Hotel and Golden Rod Rathskeller from November 1900 shows both Pomeranian smoked goose, selling for $0.70, and regular smoked goose, selling for only $0.20 an order. Adjusted for inflation, that means an order of Pomeranian smoked goose would set you back a hefty $18.62 today. In 1906 over at Stauch’s on Coney Island, you could get an order of Pomeranian smoked goose with asparagus and hollandaise sauce for the equivalent of $18.50 in today’s dollars. Clearly this is no ordinary cold cut. But was this the origin of Jim Schiltz’s smoked goose? At that point, I didn’t care. I just had to make spickgans. Pretty amazing stuff, considering that waterfowl are not known to accumulate intramuscular fat they way beef does. Reading further about spickgans, I learned that one of the keys to this smoked goose is to truss the breast or stuff it into sausage netting. 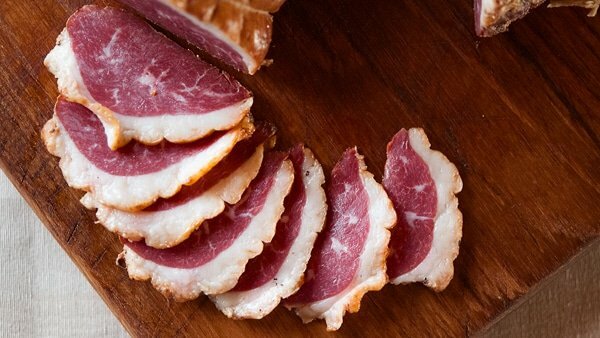 This keeps the meat compact and results in an almost salami-like cylinder of goosey goodness that is far easier to slice than a typical smoked goose breast. A brilliant idea that I am sorta angry at myself for not having thought of it earlier. 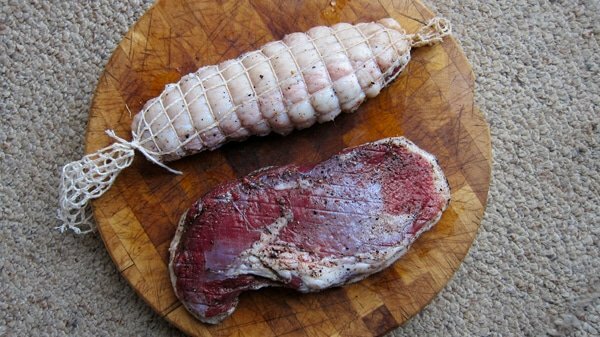 So I cured my goose, stuffed it into the netting and smoked it over alder wood for seven hours. It smelled wonderful. I sliced into it and was immediately taken back to that smoked goose that Jim Schiltz had sent me: The seasonings were a little different, but the smokiness of the meat as well as that melt-in-your-mouth texture were identical. If you have a smoker, I urge you to try this. If not, this might be reason enough to buy one. Of all the charcuterie recipes I have on this site, this is right up there at the top. It is relevatory. I promise. You need to truss your goose breast or stuff it into sausage netting, which you can buy online. While not absolutely necessary, it does change the end result in a subtle way. You will definitely need to use nitrites (Instacure No. 1) for safety and to get that pink color. The safety factor comes in with another thing you need to do to make this recipe — you need to start the goose in a cold smoker and bring the heat up to temperature very slowly. This is easy to do in a Bradley smoker, and it can be done in a Camp Chef smoke vault or in many other smokers. 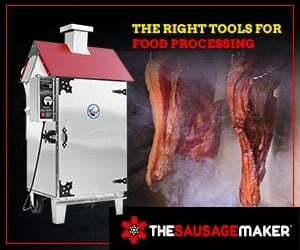 It is, however, very hard to do with a classic smoker; the kind where you start a fire near the meat. Flavorwise, you are getting a lot of character from juniper berries, black pepper and Scotch. What’s with the Scotch? Well, unless you have some means of smoking over peat, the best way to get a little of that peaty flavor into the meat is to soak it overnight in a peaty Scotch. I used Laphroaig. Can you skip this step? Sure, but if you a) like to drink peaty Scotch and b) have it around, by all means use it. I made this with domestic goose breast, but there is no reason you can't do it with skin-on breasts of Canada or whitefront geese. 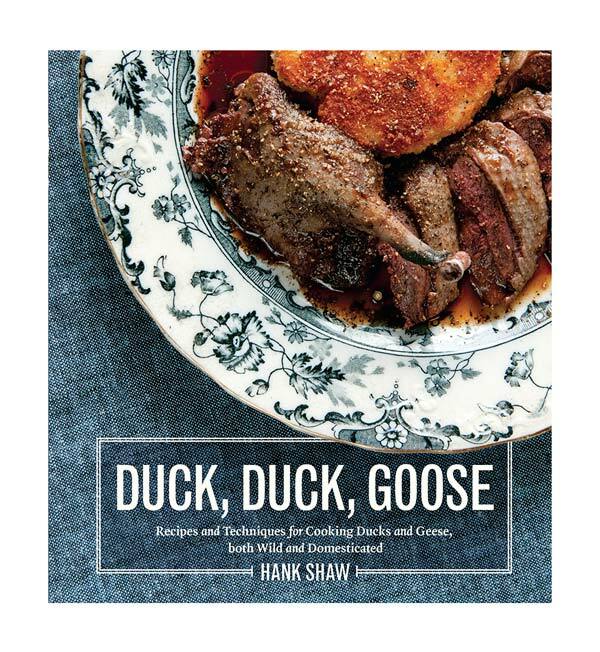 You could also use a big, domestic Moulard duck breast, too. Don't try it with skinny or small birds. You need the curing salt No. 1 for this recipe; you can buy it online. If you are using the Scotch, put the goose breasts in a bowl and coat them with the whisky. Put them into a closed container just about large enough to hold them and refrigerate overnight. The next day, mix all the remaining ingredients in a bowl. Drain the goose breasts, or just pat them dry if you have not done the Scotch soak. Massage the spice mixture into the meat, making sure every bit of the goose is covered. Put the goose breasts into a closed container that just barely fits the meat. Pour in any excess salt/spice mixture, cover and refrigerate for 3 to 4 days. Every day during the curing process, turn the goose breasts over so they are evenly coated. When the meat has cured, it will be dark red and slightly firm to the touch throughout. Rinse it off briefly under cold running water and pat it dry. Let the meat sit out in a cool place for 2 to 4 hours, preferably with some sort of breeze or fan on it. Or you can leave it to dry in the fridge uncovered overnight. Truss the meat as you would a roast, or stuff it into sausage netting. If you do the netting, wear an apron, as you will need to manhandle the goose breast into the netting. Take your time and do it little by little. Tie off the ends of the string or netting, leaving enough at the end with the most fat -- this should be the thick end of the breast -- to hang. You want the fattiest part of the goose breast at the top, so the fat can drip down and keep the meat moist. Hang the breasts in an unheated smoker and smoke over beech, alder, oak or cherry wood. Apple is a good substitute, too. Start the smoke cold and gradually bring the temperature up. Your goal is to have the thickest part of the goose breast reach 140°F to 150°F by the end of cooking. Move the goose breasts out of the smoker and allow to return to room temperature before refrigerating. The smoked goose will last 10 days in the fridge, or a year if well sealed and frozen. If you are using the Scotch, put the goose breasts in a bowl and coat them with the whisky. Put them into a closed container just about large enough to hold them and refrigerate overnight. The next day, mix all the remaining ingredients in a bowl. Drain the goose breasts, or just pat them dry if you have not done the Scotch soak. Massage the spice mixture into the meat, making sure every bit of the goose is covered. Put the goose breasts into a closed container that just barely fits the meat. Pour in any excess salt/spice mixture, cover and refrigerate for 3 to 4 days. Every day during the curing process, turn the goose breasts over so they are evenly coated. 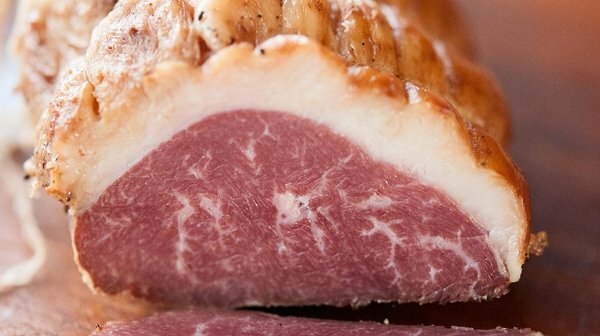 When the meat has cured, it will be dark red and slightly firm to the touch throughout. Rinse it off briefly under cold running water and pat it dry. Let the meat sit out in a cool place for 2 to 4 hours, preferably with some sort of breeze or fan on it. Or you can leave it to dry in the fridge uncovered overnight. Truss the meat as you would a roast, or stuff it into sausage netting. If you do the netting, wear an apron, as you will need to manhandle the goose breast into the netting. Take your time and do it little by little. Tie off the ends of the string or netting, leaving enough at the end with the most fat -- this should be the thick end of the breast -- to hang. You want the fattiest part of the goose breast at the top, so the fat can drip down and keep the meat moist. Hang the breasts in a cold smoker and smoke over beech, alder, oak or cherry wood. Apple is a good substitute, too. Start the smoke cold and gradually bring the temperature up. Your goal is to have the thickest part of the goose breast reach 140°F to 150°F by the end of cooking. Move the goose breasts out of the smoker and allow to return to room temperature before refrigerating. The smoked goose will last 10 days in the fridge, or a year if well sealed and frozen. I have all sorts of recipes for smoked meats and fish here on Hunter Angler Gardener Cook. How would this work with wild goose breasts. Is there anything that you would change or adapt? Ed: It works well. Make sure the skin is on and the bird is fairly fat. Having Spickgans on Christmas Morning is my German family tradition / secret! There is only one place here in Chicago that sellers it. My Grandmas family tradition was to prepare the meat a week prior to Christmas and then they would smoke it in a smoke shack for 7 days at very low heat and all the relatives would take turns taking a shift to watch the fire and turn the meat. Having this receipt is priceless since the smoking recipe and process was lost when the Spickgans were available for purchase. Now that there is only one butcher who sells it in the whole city it is a treasure to know how to make it. 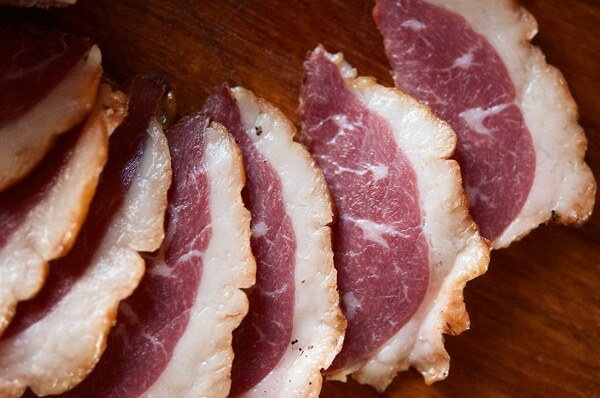 We have tried for years to search for native Germans who know what this is but since it is a meat from a specific area of Germany many think we are crazy to love it so much! Thank you! Spickgans. This is my absolute favorite use for Canada goose breasts. I make it every year, and have some on hand at all times. Relevatory indeed.